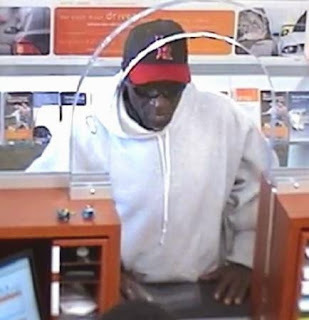 UPDATE MAY 13: The FBI has identified the offender in this case as the "Bandage Bandit," who is wanted for several bank robberies across Chicago. A $10,000 reward is offered for information leading to this man's arrest. A man who passed a note and implied that he had a weapon robbed the Chase Bank branch at 3032 N. Clark shortly before 2 o'clock Saturday afternoon. No one was injured in the $900 heist. 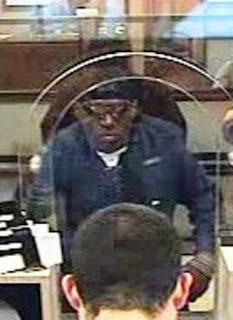 Witnesses describe the offender as a black man in his mid-30's, about 6-feet tall, 160 pounds, wearing a shiny black du-rag, reflective sunglasses, a black jacket, and silky "narrow cut" gym pants. Last Saturday morning, Standard Bank and Trust at Broadway and Irving Park Road was robbed by a man who implied that he had a weapon. That offender was described as a black man, possibly in his 30's, wearing a skull cap, red hoodie, and khaki pants.